There are several scenarios where there is the need to send a notification using an SMS. The main target of this tutorial is describing, step by step, how to implement an IoT system based on Android Things that send SMS notification through Twilio. We all know the importance of IoT as a disruptive technology that is revolutionizing several economic areas. We do not need to describe what is IoT and how to use it. Moreover, Android Things, the new IoT OS made by Google, has reached the necessary maturity to be used in production environments. The latest Android Things version, 1.0, is the first and stable version that promises to introduce a new paradigma in developing IoT apps based on Android. We have covered several Android Things aspects in previous posts so it is not necessary to underline, another time, the important role played by Android Things in the IoT ecosystem. We have already covered some of these methods in previous posts. In this one, the tutorial covers how to implement an SMS notification systems. After all, the SMS is the first and the oldest notification method widely used in several contests. Before delving into the project details, it is useful to have an overview of what we will implement, and the overall architecture that stands at this project base. To focus the attention on the main project topic, or building an SMS notification system using Android Things, we can suppose that the event, we will notify, is triggered by the value read using a simple temperature sensor. Even if this could be a simple approach, it can be further extended. First of all, we can suppose there are other kinds of sensors that can trigger an SMS notification. Moreover, we can suppose that the Android Things device is the collector of several MCUs that manages several sensors and exchange data with Android Things using MQTT or other protocols. In this way, it is possible to centralize the SMS notification system and several MCUs can exploit this system. That said, the figure below describes the Android Things project architecture we will implement during this IoT project. The sensor used in this tutorial is BMP280 or BME280, but it is possible to use other kinds of sensors as long as they are compatible with Android Things platform. Let us start with the first step. In the first strategy, the Android Things app reads the sensor data only one time and to have several data samples we have to read the data using a specific time interval. On the other hand, Android Things can read data from sensors continuously. This second approach is useful when there is the need to monitor continuously a physical quantity like a temperature, pressure and so on. This IoT project used this second approach. This will add the necessary classes to make Android Things exchanging data with BMP280/BME280. where SensorManager is the Android Things API class that manages the sensors in Android Things. The BMP280 or the BME280 is a sensor that reads the temperature and the pressure so we register both listeners. Moreover, the app defines how often the sensor data must be acquired using SENSOR_DELAY_NORMAL. 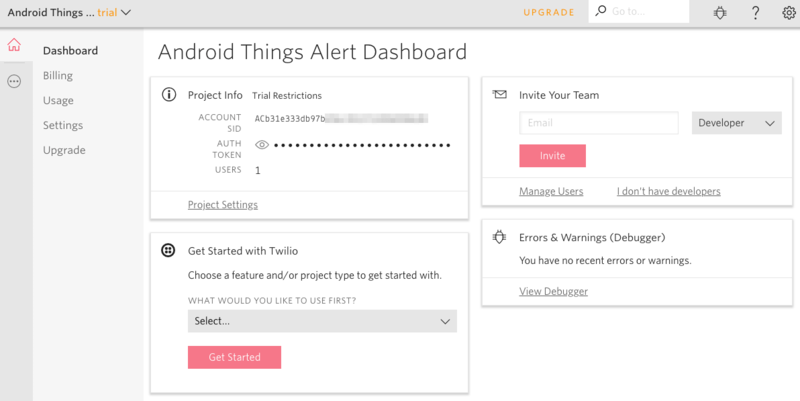 Now we are ready to configure Twilio. Clicking on “Make request”, you should get the SMS on your smartphone. This is the last step of this project, where we will implement the Twilio client in Android Things that will send SMS notification to our smartphone when a specific event occurs. In this example, we can suppose to monitor the temperature and send an SMS when it is over a threshold. Let us create a new class named TwilioCient.java. This class will manage all the communication details. To this purpose, we will use OkHTTP. In this method, we send not only the SMS notification but we check that we did not send a message already. 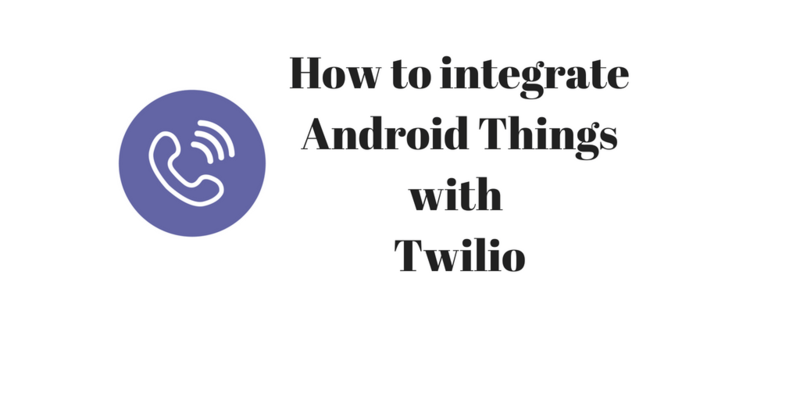 At the end of this post, you learned how to implement an SMS notification system using Android Things and how to integrate Twilio with Android Things. As described previously this simple tutorial can be further expanded to cover several use cases where there is the need to notify an event to an use using SMS.